I was SO inspired by paint-watercolour. Printed photo(g-grandmother)on matt paper, painted it with water colour, accented with white pen. Then stamped patterns onto water colour paper, painted those, punched circles and cut flowers out. Used Blue, yellow, orange, red, purple, green-6 colours. Blinged the circle centers, the first letter of the title and used some sparkly snowflake dimensional stickers layered on the flowers. I LOVED this challenge and worked on it all day. Your handy work is amazing - I am so impressed, your finished LO is stunning!! The colors and how you have clustered them is fantastic - well done!! Oh my, oh my Jem, this is amazing. Jem this is so incredibly beautiful. I can't believe how much work must have gone into painting the photo but it looks sooooo good. Just gorgeous Jem. I can understand why it took you all day, with all the beautiful detail. Furthest away & first up. Thank you. 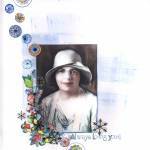 I was inspired by Anna's watercolour and Sue-Maree's stamps. Oh, blimey, Jem, this is a stunner! You are so marvellously artistic. Congrats on such a beautiful page.